Aneurysm. 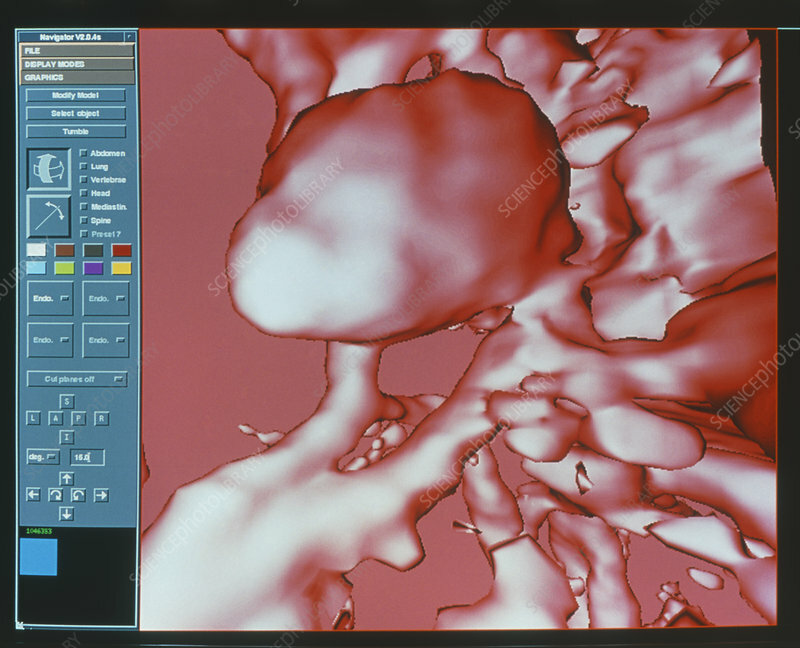 Three-dimensional computed tomography (CT) scan of an aneurysm (upper centre) in the blood vessels of the circle of Willis. This is a ring of blood vessels at the base of the brain. An aneurysm is a ballooning of the wall of a weakened artery caused by the pressure of the blood flowing through it. The pressure this swelling puts on the brain may cause symptoms such as a loss of control of some facial muscles and unconsciousness. Aneurysms may also rupture, which can be instantly fatal or lead to paralysis. CT scans use X-rays to take slice images through the body, which can be combined to obtain these 3-D views. This allows non-invasive study of the body's interior.